"Alone, Yet Not Alone" by Tracy Leininger Craven is based on the true story of two young sisters who are captured by Allegheny warriors during the Penn's Creek Massacre of 1755. The Leininger family immigrated from Germany to escape religious persecution and start a new life in Pennsylvania. Little did they know that their lives were going to be turned upside down. 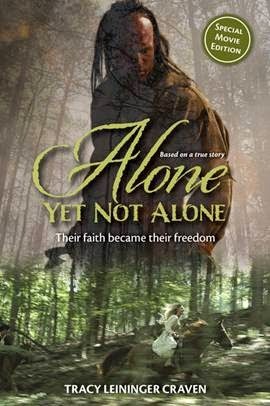 The novel "Alone, Yet Not Alone" tells the story of the capture of Barbara and Regina Leininger (ages 12 and 9 at the time) and how "their faith became their freedom." The message of faith comes through in the novel loud and clear. Barbara believes they can make it through with Christ's strength and that no matter what happens their faith in Jesus Christ can never be taken away from them. Barbara reassures her younger sister, Regina: "God will always be with us - even in our most difficult trials." Unfortunately the sisters are separated. Barbara is left clinging to the hope that her sister's faith will remain strong and that she will not lose the song in her heart: "Alone, yet not alone." This novel is an easy read and is aimed at pre-teens. Keep in mind that it has some mature themes that may not be appropriate for all readers -- although those scenes are not described very graphically. Some interesting topics for discussion include the origin of the world according to the Allegheny people and their spiritual beliefs. The novel has a strong emphasis on the need for a Saviour and on the redemptive power of Jesus' blood. Tracy Leininger Craven states: "It is my prayer that those who read this book will be encouraged to run the race of life with undaunted faith and endurance -- drawing strength from the author and finisher of our faith, Jesus Christ." Win it: One Sowing Dandelion Seeds reader will win a copy of the book "Alone, Yet Not Alone". Disclosure: I was given a copy of this book from Media Connect in exchange for my honest opinion. I love that hymn too Mrs B! When my grandfather passed I felt quite alone but I felt gods presence and knew my grandfather was in a better place. Amy, I'm sorry about your grandfather's passing, but glad to hear that you knew God was with you. My favorite is "Great is Thy Faithfulness!" I like the hymn How Great Thou Art. I always enjoyed singing "How Great Thou Are"
I love singing it too! It's such an amazing song to God's glory! I love "How Great Thou Art" and "It Is Well With My Soul." These are two of my all time favourites! Ah, so many hymns are favorites of mine. Just now I'm thinking of "He Keeps Me Singing." Thanks for what looks like a wonderful book giveaway! Great question! Right now, I am on a "Go Light Your World" kick! Farther Along is my favorite. I love Josh Garrells' version. Actually- the last few days have been filled with the presence of God. Here I am to Worship is my favorite for sure! Thanks so much for the chances to win. That's one of my favourite modern praise and worship songs. A time that I felt God's presence strongly was when I had to spend 4 days in the hospital. I could barely see, and my entire body was covered in a blistering rash, but I felt His peace. I knew that everything would turn out ok.
That sounds horrible (was it shingles?). I'm so glad that you felt God's presence and peace so strongly.